Unless you’re brand new to the world of music (and even then, probably) you’ve heard of Fender. However they’re much more famous for their electric instruments than their acoustics. While we have played a few of their acoustic guitars before, we was curious to find out how their different ukes stacked up. After some research, we decided to buy their Fender Tenor Ukulele-Nohea model; the price was right, and it was a great-looking instrument with Koa wood styling (as well as a handsome rosewood bridge), retro tuners, and abalone inlays. It comes with its own gig bag, but we decided that it will looks cool on a wall so we bought a wall-mount for it as well. Now we can show it off to the world. So far, we really enjoyed the Fender Tenor Ukulele-Nohea; the intonation was right straight from the box, which is what you should expect at this price point. The fretboard is smooth and easy to play on. The construction and the bracing all seem to be high-quality, which is good, because if you live in a humid area, and uke comes “unglued”, that’s a problem. The tone of the instrument is bright, and while it’s not quite as punchy as our favorite “go-to” tenor, but we like it a lot and would definitely consider using the Nohea as go-to back-up uke for gigs and recordings. As a side note, we did find that the sound of the instrument improved (at least to our ears) when we replaced the stock strings (something that’s become a habit over the years). We would rate the comfort of use very high with this Fender; it’s honestly the most comfortable uke you can find at this price range, which can make a big difference whether or not you want to play it! A lot of that is owed to the high-quality mahogany neck. The Koa wood sides are very attractive, but buyers should know that they are actually a Koa laminate. It certainly doesn’t matter to everyone, but if you’ve got any negative feelings about an instrument made with laminates, the Nohea probably isn’t for you. The other thing to know is that this is only an acoustic uke, not an acoustic-electric. That’s not necessarily a bad thing, just know that if you’re planning to play the Nohea at a show, you’ll need either a soundhole pickup or a microphone to pick up and amplify the ukulele’s sound.. Overall, we extremely happy with this purchase. It’s the perfect axe for jamming, or playing shows (provided you buy a pickup for it, or mic it up). As a matter of fact, our friend even used the Nohea on a few folk-y recordings that he made, and he sad that it brought them a really nice, mellow quality. Should you buy it? There are too many personal preferences to say, but you should definitely try it out. If you’re not sure to start, or you’re buying this instrument for a child or a loved one, this is a good body style to start out with. 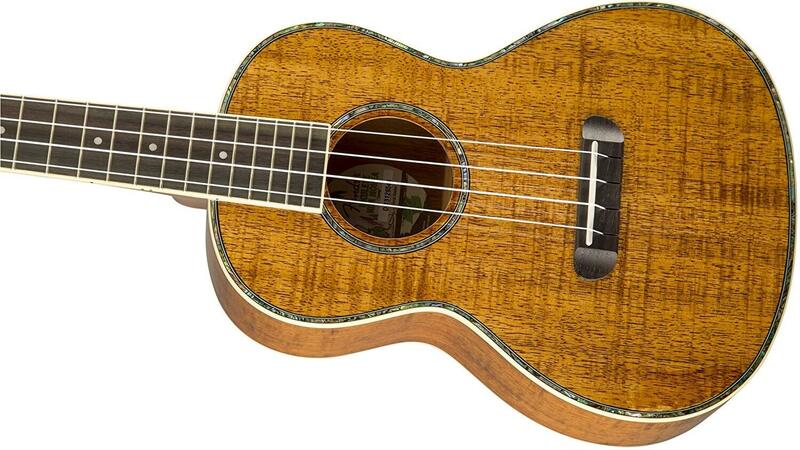 The Fender Tenor Ukulele-Nohea is a fantastic little uke for beginners and intermediate players alike.